Single-player, robot sidekicks and new planets. 2015's Star Wars Battlefront had the spectacle of the movies, but not a lot of meat beneath that, particularly at launch. Battlefront 2 is a clear answer to that criticism. It's an effort by three EA studios of different disciplines—DICE (multiplayer), Criterion (vehicle design), and Motive (narrative)—to build the ultimate version of what Battlefront has always promised: a soldier's perspective of cinematic Star Wars battles. The effort to achieve that will bring us a revamped multiplayer, with more options and progression systems available to the player than before, and a dedicated single-player mode that gives us an in-depth look at the saga from the perspective of the Empire's special forces. It's a convincing plan to build a fuller game than the original, and the story aims to sit alongside The Force Awakens and Rogue One in showing us some new and interesting perspectives of a galaxy far, far away. Battlefront 2's campaign begins with the destruction of the second Death Star at the end of Return of the Jedi, as you may have figured out from last week's leaked trailer. That moment in the film is framed as the ultimate Rebel victory. Motive wants to subvert that. “How can we turn that victory into a loss, into a moment of defeat?” says the studio's game director, Mark Thompson. You primarily play as Iden Versio, an elite soldier who swears loyalty to the Emperor, with her father having served as a high-ranking general within the Imperial forces. Motive wants to explore the kind of character who inspires belief in the Empire, whose achievements encourage kids on Empire-occupied worlds to sign up to the Imperial academy. Iden comes from the planet Vardos, a newly created world in the Star Wars universe, which looks a little like a mix between Mass Effect's Citadel and some of the upper class areas of the city in Mirror's Edge Catalyst. A piece of concept art shows off gorgeous red trees, futuristic buildings covered in the Imperial insignia, and even a sci-fi monorail. The developers describe Vardos as an Imperial utopia, where the Rebels are considered terrorists and belief in the Empire's ideologies is absolute. They'll explore why your character sees the Empire as she does. Iden's unit, codenamed Inferno Squadron, conveniently straddles several Battlefront-friendly combat specialties. You're both a pilot and a commando, infiltrating and sabotaging. Iden's supposed to be relatable, and she's portrayed as a hero of the Empire rather than an enemy of the Rebellion. That said, the story will show you both sides of the aftermath of Return of the Jedi, including one story mission where you get to play as Luke Skywalker, with an appearance by Kylo Ren also being teased. The developers reference a couple of new ideas that'll cross over between the campaign and multiplayer. Players have robot sidekicks, for example, which confused me for a second until I realised that they probably mean 'drones in space.' The Imperial versions seen in the trailer resemble little Imperial probe droids, and their tactical use is yet to be properly explained, though one seems to use a small electric shock ability. While Battlefront 2 introduces fixed classes, gadgets and abilities can be customised, though we're not exactly sure what these will specifically entail yet. You can also unlock new gadgets and abilities for vehicles, too. When it comes to the online side of things, DICE is using the word 'career' a lot. There's multiplayer support for up to 40 players this time, with brand new modes and maps set across different eras of the Star Wars saga. At the very least we'll see the aforementioned Vardos, Yavin IV, Kamino, Endor, Starkiller Base, Mos Eisley, and Hoth used as backdrops, with unit types to match, like the Trade Federation's battle droids (everyone's favourites). Then there are space battles, with a revamped spaceship combat system designed by the Burnout team at Criterion. There'll be more craft to choose from this time, too. In one piece of concept art, we see Jango Fett's Slave I chasing what is, I'm guessing, Obi-Wan Kenobi's Jedi Starfighter on Kamino from Attack of the Clones. Progression in Battlefront 2's online sounds like it's had a significant overhaul. Basic soldiers, hero characters, and even vehicles can be upgraded and customised now. Again, we're left to speculate on how that'll work, but they've clearly thought hard about how to get players to commit to the multiplayer over a longer period of time. Vehicles have mods, abilities and gadgets, and the devs want them to have the same personality that the hero characters do. I've spotted Luke, Kylo Ren, Rey, Jango Fett (or at least his vehicle), Darth Maul, and Yoda so far. Heroes were a little flimsy to control in Battlefront 1, particularly when they fought each other, so DICE says they're making them have more physicality this time. You can personalise heroes to your play style, although again, we were not shown how. The way you obtain heroes will be a resource-based system this time, rather than being the first to pick up tokens in the battlefield. While the heroes are meant to be game-changing powerful units, DICE also mentions that a basic soldier who's been significantly levelled up may be able to stand against Darth Maul in combat. The word 'career' is used by DICE again, suggesting your faceless troopers can progress to the point where they're canon-shattering badasses. This was EA's opportunity to lay out the grand plan for Battlefront 2, to make it absolutely clear that the game will be packed with stuff to do from day one. Specifics on multiplayer are particularly thin, likely being saved for a splashy showing at E3, but it certainly sounds like Battlefront 2 won't be short on fan service especially when compared to the original. 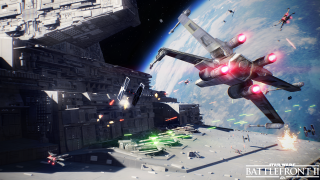 The big challenge for DICE is how they keep people playing Battlefront 2 online after the appeal of the spectacle and Star Wars iconography wears off, something which we have a vague grasp of after this showing. Gadgets, deeper customisation, and multi-layered progression systems may be the answer—now we just need to see them in action. Star Wars Battlefront 2 hits PC on November 17. You can watch the reveal trailer here.